Title: 'A New and exact Map of France Divided into all its Provinces and Acquisitions according to the Newest Observations and that accurate Surevey made by the King's Command by Mr. Picar and de la Hire, with the Post Roads and the Computed Leagues from Town to Town, the Pass of the Pirenean Mountains, and many others Remarcks &c. By H. Moll Geographer'. A striking and highly decorative interesting oversize copper engraved 1720c. Moll's map of the Kingdom of France. The map covers France, northern tip of Spain, Belgium, Luxembourg, north-western Italy, Switzerland, part of Germany and southern coast of England. The map provides excellant details concerning cities, towns, rivers, lakes, bayes, reliefs, forests and islands. A large decorative cartouche showirng Ares, Athena, Venus, an allegoric portrait of the King as Apollo, cherubs, a globe, the French Royal Armorial, the views of Paris & Greenwich Observatories and weapons adorns the map. 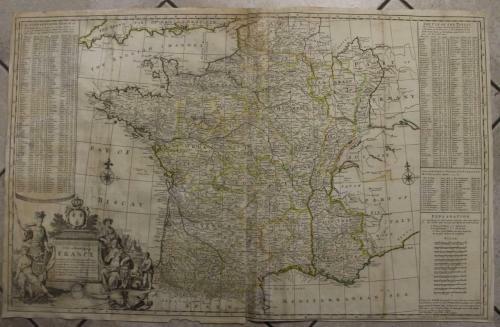 The map is flanked with a ribbon including a list of the cities of France and with an explanation table along right lateral side. The map is in fair condition: the margin to the top is partially loose, redone and handwritten. Lower margin partially missed, redone and handwritten to the right side. Title cartouche partially loose, redone and ahandwritten, as you can see in the images. Small foxing and browning. Small holes repaired. Map partially redone and handwritten. Map heavy washed and restored, as you can see in the images. Map folded. Would frame well for an impressive large map that is very decorative.